Steam was already coming out of the train engine as Asbjørn Halvorsen waited to leave Hamburg after having served HSV as both a player and a coach for more than 12 years combined. He had left his home country of Norway in 1921 and travelled to Germany to learn the German language and to work for Sloman, a shipping company. Halvorsen becoming a city legend came as pure coincidence. Through the mass of travellers, one person managed to make his way through to the Norwegian. Otto Fritz Harder, better known as “Tull,” simply wanted to say ‘goodbye’ to his friend of many years. Harder had at first assumed that his friend would board a ship. When he couldn’t find Halvorsen at the harbour, he went as quickly as he could to the train station. The long-time friends said farewell, and both went off in entirely different directions. Asbjørn Halvorsen was one of the most-distinguished footballers in Norway from an early age; he made his debut for Sarpsborg’s first team by the age of 17 in 1916 and led his team to the Norwegian championship capped by a 4-1 trouncing of Brann one year later. By then, his leadership abilities on the pitch had cristallized and the youngster had already been the made captain of his club side. This same year he made his international debut for Norway, and he played in a total of 19 matches for his country. His talents on the pitch made Harder one of the most popular athletes in all of Germany, not just Hamburg, after the war. The German movie Der König der Mittelstürmer was based on his life, and a tobacco producer even released Tull Harder cigarettes. It was no secret that Harder had a nationalistic point of view when it came to his politics. After his career as a footballer, he made a name for himself in the SS. Despite being vastly different characters, Harder and Halvorsen managed to bond. Those who have known and worked with Halvorsen describe him as a man who gave clear-cut orders in a respectful way, as well as being a person with brilliant sense of humour. Maybe it were those qualities that allowed the two of them to become friends. There’s very little doubt that Harder appreciated the service he was getting from the man playing behind him. Once the two were allowed to play together, HSV turned into the most successful team in Northern-Germany during the 1920s. Halvorsen was the brain in midfield, marshalling his troops, and providing service for Harder. Whenever a pass needed to be played precisely or a solution to a tricky defence needed to be found, HSV could count on these two players to provide it. Winning the Northern-German championship qualified HSV for the final round of the German championship. In 1922, the team underwent an ordeal in the final facing 1. FC Nürnberg. Neither team could seemingly win – the penalty shootout session hadn’t been invented yet – but the teams had to continue playing for a long time. The score remained 2-2 after 189 minutes, and Nürnberg were down to 7 men (substitutions weren’t allowed yet either). At this point, the two teams and the referee decided to call it a day due to darkness, with neither side having won. Going by the records of the DFB, there is no official champion for the 1921-22 season, because HSV decided to not accept the championship that was awarded to them by the DFB at the green table. The players, however, felt like they had won the championship. Tull Harder was gifted a cigarette case, which was engraved with the line “In memory of the German championship of 1922, which was won by HSV.” Halvorsen added by hand, “And rightfully so. Yours, Assi.” “Assi” was Halvorsen’s nickname. One year later, HSV had no troubles winning the German championship. In the final of 1923, the red shorts faced Union Oberschönweide (a predecessor of 1. FC Union Berlin). 64,000 had come to seen the final in Berlin, and HSV and their two most important men didn’t fail to impress. Harder provided the first goal of the match in the 34th minute, and from then on, it was smooth sailing for the Northerners. Ludwig Breuel and Otto Schneider provided HSV’s final two goals to provide the 3-0 final score. Tull Harder and Asbjørn Halvorsen with the wreath for the German championship win in 1923. (The rights for the picture are held by HSV Archiv). Five years later, HSV once again reached the final of the German championship. Once again, it was Tull Harder who provided the first goal of the match. After 20 minutes,the game was pretty much decided, as Hans Rave and Walter Kolzen added two goals for HSV by then. In the end, the red shorts downed Hertha Berlin 5-2. Even more impressive than the titles, Halvorsen and Harder collected outstanding individual tallies. The Norwegian competed for HSV in 233 matches, scoring 19 goals. Harder was so efficient with his scoring chances, he makes Gerd Müller’s record look poor. The striker scored a staggering 387 goals in 211 matches for HSV. 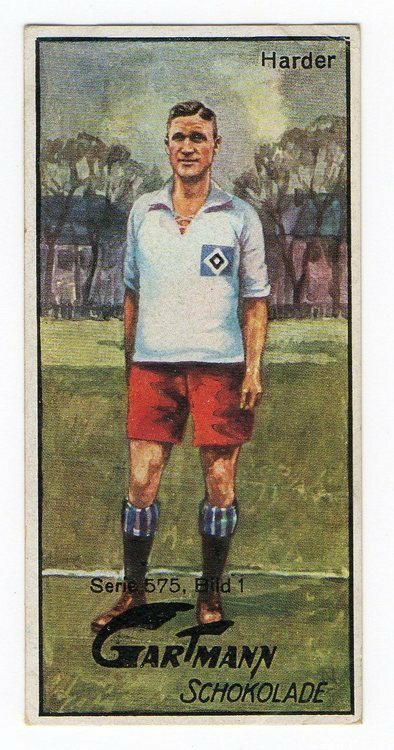 His potency in front of goal was even noticed by the cabaret scene in town, and one of the most popular songs during the 20s stated that HSV were guaranteed three goals during any given match as long as Harder was on the pitch. Harder left the club in 1931. Halvorsen left two years later. In his last season at HSV, the Norwegian even filled in as team coach. HSV went on to win the Northern-German championship in both 1932 and 1933. However, the Norwegian never liked the Nazis’ policies and decided ultimately to leave the club. During his testimonial match, he was awarded with gifts and smiled, but he was the only player on the pitch who didn’t participate in the Nazi salute. Despite their political differences Halvorsen and Harder managed to stay friends for the duration of the Norwegian’s stay in Hamburg. After the Nazis managed to grab power in Germany and Halvorsen decided to retire, however, the Norwegian returned home. The meeting at the train station might have been the last time the they saw each other, though there may have been a banquet 20 years later when the two of them possibly could have run into one another (more on this event later). After returning to Norway, the midfield genius took over the Norwegian national team. Halvorsen hadn’t played for the national team since 1923, but his skills as a leader were undisputed. Three years after leaving Germany, Halvorsen took the Norwegian national team to a bronze-medal finish in the 1936 Olympics in Germany. On their way to the semifinals, the Norwegian national team beat Germany 2-0, with both goals scored by Magnar Isaksen. That game, played in the Poststadion in Berlin, is the only football match Adolf Hitler watched in his entire life. Halvorsen’s team’s performance was so good, it made the Führer leave early and enraged. In 1940, Halvorsen was once again caught in a country ruled by the Nazis when Norway was invaded by Hitler’s army on April 9th, 1940. Halvorsen positioned himself early on, writing a letter of protest against the Nazis’ sporting philosophy. Democratic principles were important to Halvorsen, and he stayed true to these beliefs when he banned Josef Terboven, the man who was Hitler’s man in charge of Norway, from the royal box during the Norwegian cup final. This area of the stadium was reserved for the Norwegian Royal Family, who were in exile in England, according to the former HSV player. Tull Harder photographed during his time in the concentration camp Neuengamme. (The rights to the pictures are held by the HSV Archiv). Tull Harder’s life took a different path after the Nazis took over. After joining the NSDAP, Hitler’s party, Harder became part of the SS. During his service, he managed to reach the rank of SS second lieutenant. During the war, Harder served the organisation in the concentration camps of Sachsenhausen, Neuengamme, Hannover-Stöcken, and Ahlem. The forward had already been vocal about his nationalistic views during the 20s, and even the loss of Germany couldn’t change his mind. During his trial for war crimes in 1947, Harder was unapologetic, defending the actions taken by him and the Germans during WWII. Besides taking principled stands against the Nazis publicly, Halvorsen was also influential in organising the boycott of sporting competitions created by the occupants. For the entire war, many Norwegian athletes didn’t participate in organised competition. Halvorsen’s fight against the Nazis didn’t stop here, however. He was also involved in the publication of the resistance papers Bulletinen and Whispering Times. Unfortunately, the Gestapo managed to find the hideout where the Whispering Times was produced, and Halvorsen was arrested on August 6th, 1942. After having spent a year in prison in Norway, the former HSV player was sent to Germany. On July29th 1943, Halvorsen boarded the Monte Rosa together with other prisoners of war. After arriving in Stettin, they were placed in a prison, where most of them felt like they were dying due bad ventilation and a lack of water and food. On August 6th, Halvorsen arrived at the concentration camp Natzweiler. The commander, Josef Kramer, who greeted the new arrivals, told Halvorsen and the other prisoners that the only way out of camp was through crematorium’s chimney. During their stay at Natzweiler, the prisoners had to work in a stone pit for twelve hours a day. The point of these types of camps was to isolate the prisoners from what was going on back home and to leave those who had been left back home guessing about the fates of their loved ones. The Germans called these places Nacht und Nebel Lager, which translates to night and fog camp. One of the Norwegian prisoners alongside Halvorsen was Trygve Bratteli, who later became an influential politician for the Norwegian Labour Party and Norway’s prime minister for two spells in the 70s. In his book about the time he spent as a prisoner, Bratteli wrote that many crumbled under the hard work, epidemics were commonplace, the German guards quickly punished the workers with physical violence, and the workers suffered from the malnutrition. Another Norwegian prisoner, Kristian Ottosen, wrote after the war that Halvorsen’s presence in the camp befuddled some of the guards. There he was, a prominent footballer who had accomplished so much. The fact that he once was a star helped Halvorsen. He wasn’t asked to do the most-physically demanding work and was given instead administrative duties. During his time spent in Natzweiler, Halvorsen used his prominence to help the other Norwegian prisoners. He provided them with some extra food and lighter work duty and sent a doctor their way when they needed medical attention. Alongside him was the Norwegian doctor Leif Poulsson, who became a close friend and followed Halvorsen from camp to camp. On January 5th 1945, Halvorsen was sent to the Vaihingen concentration camp, located between Stuttgart and Karlsruhe. His arrival boosted the morale of several camp prisoners. The former HSV player had always been informed by his contacts in Natzweiler about what was going on outside, and this time he could also bring his fellow countrymen news about the war. Once again, Halvorsen managed to help the Norwegian prisoners by using his contacts to increase the amount of food sent their way. However, the prison guards turned on the Norwegian when he refused to hit another inmate. The former midfield genius was punished with torture because he failed to comply with the guard’s wishes. As Halvorsen was carried to the bus, weighing just 48 kilos after years of malnutrition, he collapsed. Leif Poulsson and a German doctor managed to bring Halvorsen back to life, and as the German doctor listened to the former HSV player’s heartbeat, he stated, “Na, das ist keine Omega mehr!”, meaning that Halvorsen’s heart wasn’t working like clockwork. On the bus, Poulsson was told in no uncertain terms that he needed to keep Halvorsen alive. Halvorsen and the others were sent to the concentration camp Neuengamme. Tull Harder had worked here, but the SS man had left a few months prior to his former teammate’s arrival. In Neuengamme, a place just outside of Hamburg, the Red Cross looked after the Norwegians. There was little doubt that those who had been incarcerated in Vaihingen had been suffering severely under the conditions there. Bratteli noted that the prisoners who had been in Sachsenhausen looked fat compared to the ones who had been in Vaihingen. Halvorsen and his friends weren’t safely on their way out of Germany though. Their bus was shot at by German troops, but luckily the bus made it to the ferry which took the men to Sweden. Nickolai Johansen, Halvorsen’s former assistant, had come from Norway to greet his old boss upon arriving in Sweden. At first, the former HSV midfielder was taken to Helsingborg Epidemisykehus (a hospital for epidemic diseases), before staying at Ramlösa kurbad (medicinal bath). Until the end of June, Halvorsen was the guest of the Swedish Football Association, which allowed him to stay in Stockholm until he had gotten a bit better. After returning to Norway, Halvorsen was influential in creating the Norwegian league system. He spent the rest of his life working for the Norwegian football association (NFF) as the general secretary. In 1951, he declared that Norway could compete against Germany again. Two years later, Germany and Norway faced off twice during their qualifying campaigns to reach the World Cup in 1954. Ironically enough, Germany’s home match against Norway was played in Hamburg, which allowed Halvorsen to travel back to the city where he had lived and been a hero for so many years during the 20s and early 30s. At a banquet after the match, German national team coach Sepp Herberger reached out his hand, apologising for the Germans’ treatment of Halvorsen during the war. The man who had been subjected to a world of pain for so many years shook Herberger’s hand, saying that both he and the Germans could move forward now. Kicker interpreted this statement to mean that Halvorsen had forgotten all about what had happened to him during the war, but that seems to be rather unlikely. The paper even wrote that Herberger and other German football officials had begged the Nazis during the war to release the Norwegian from the concentration camp; that, in itself, seems even less likely to have been the case. Among the people who were invited to the banquet after the match was Tull Harder. The former striker had been sentenced to 15 years imprisonment in 1947, but was released after only serving four. Upon returning to HSV, the club celebrated his return. During the celebrations, Harder was lifted up into the air several times. It was best forgotten what had happened during the war, both for HSV’s and Harder’s sakes, it seems. Whether the two met at the banquet and had one last chat is unknown. If Harder reached out his hand and apologised to his friend of so many years is always going to remain an unanswered question. Halvorsen would have probably taken his hand and accepted his apology. On January 16th, 1955, Halvorsen was found dead in a hotel room in Narvik. He had been in meetings with officials from Northern-Norway, and, as always, he was serving the world of football. The years in Hitler’s concentration camps had taken their toll, and Halvorsen died of the late causes of his typhus infection. Tull Harder died on March 4th 1956. His coffin was carried by HSV youth players, with the club flag on top of it. Several officials from the club attended his funeral. The Bundesliga fanatic would like to express its gratitude to Niko Stövhase at the HSV Museum who provided us with the fantastic pictures featured in the article!